Dome shaped, dense, slow growing evergreen with stiff, thick, dark green leaves covered by a thin grey indumentum when young. 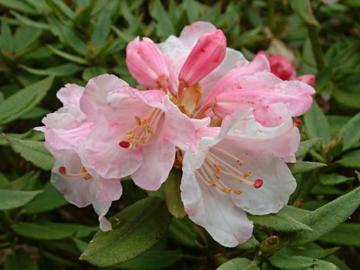 Trusses of bell-shaped pale pink to white flowers with deep pink markings on the outside and dark pink spots inside. Mid-spring flowering. Introduced from Taiwan about 1918, by Ernest Wilson.